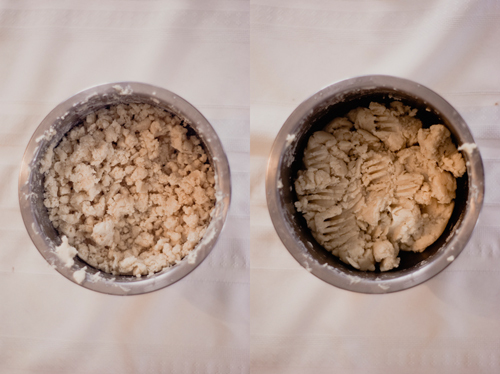 Measure flour by dip-level-pour method, or by sifting. Mix flour and salt in bowl. 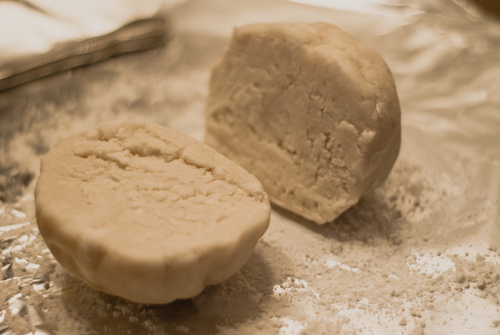 Cut in shortening with pastry blender until particles are pea-sized. 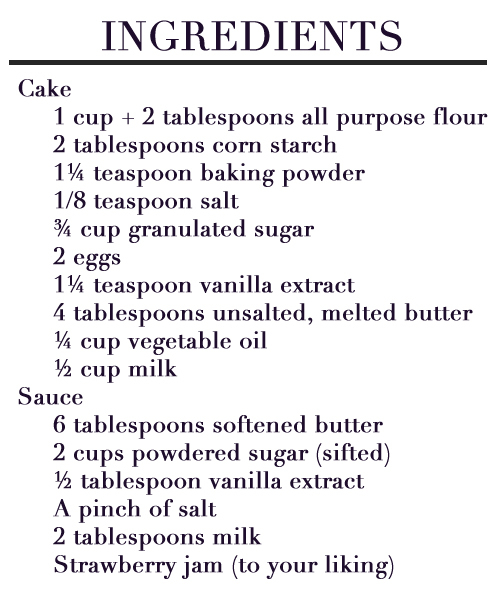 Sprinkle with water, one teaspoon at a time, mixing with fork until the flour is moistened. Gather dough together with fingers so it cleans bowl. Press into ball. Place on lightly floured wax paper, or aluminum foil, then divide in half. Prepare rolling pin by adding flour. Flatten with hand and roll it out to be not quite 1/8" thick. 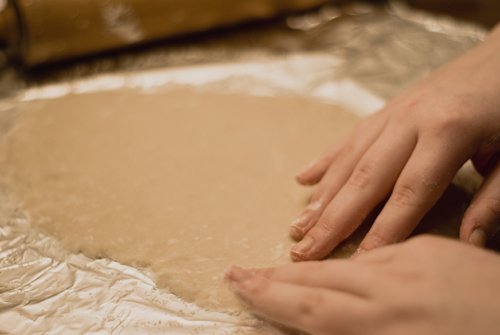 Roll lightly, being careful not to add extra flour as that makes the pastry tough. Try to maintain round edges. 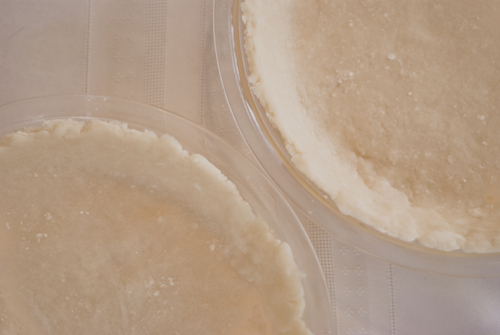 Keep pastry circular and transfer to pie pan. Repeat the process for the remaining pie pan. 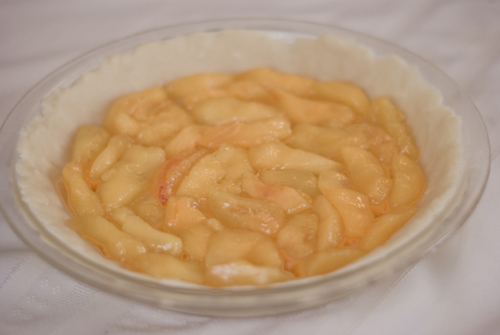 Arrange peaches in pie shell, forming a layer of tightly packed peaches. 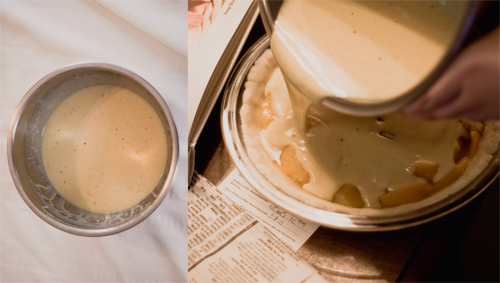 Combine sweetened condensed milk, eggs, butter, lemon juice, cinnamon, and nutmeg in large mixer bowl; beat until smooth. Pour over peaches. Bake for 10 minutes. 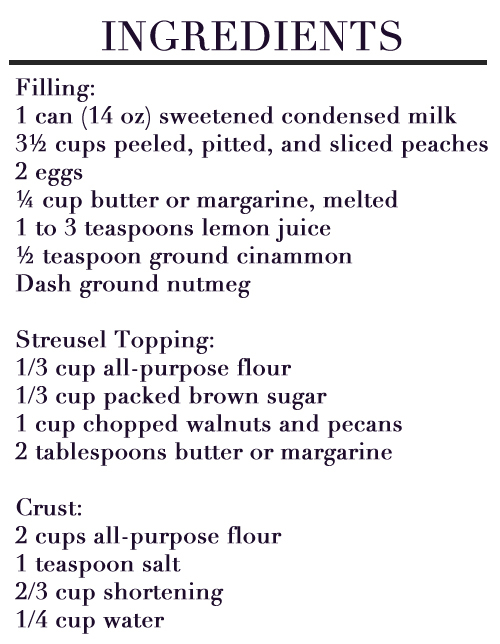 In the meantime, combine your ingredients for the struesel topping with a pastry blender. 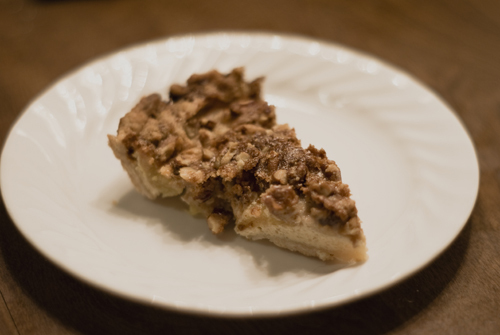 Sprinkle both pies with the streusel topping, and reduce oven temperature to 350°F. 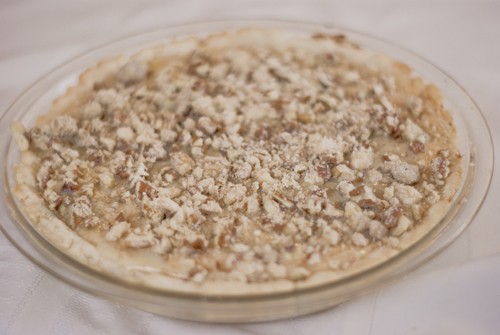 Bake for an additional 55 to 60 minutes, or until knife inserted near center comes out clean. Cool on wire rack. You can serve this both warm and cold., but make sure you store it in the refrigerator. Preheat oven to 350°F. Line a 12-cup muffin pan with paper or foil liners. In a medium bowl, whisk the flour, cornstarch, baking powder, and salt. Set aside. In a large bowl, using a handheld electric mixer, beat the sugar, eggs, and vanilla extract at medium-high speed, until smooth and thickened slightly (about three minutes). Add the butter and oil, and beat until incorporated. 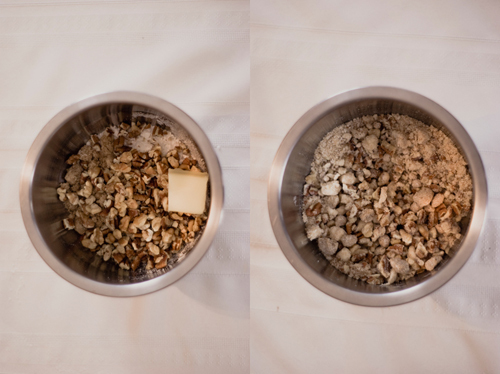 Add the dry ingredients and milk in an alternating pattern, beating well between additions. 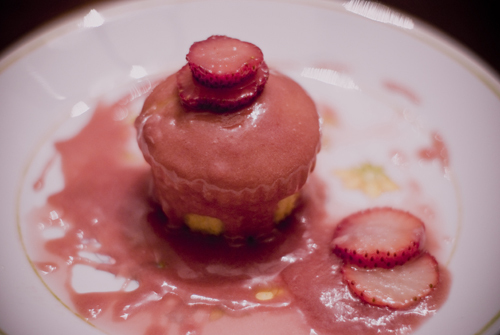 Carefully pour the batter into the lined muffin cups, filling them about 2/3 full. Bake the cupcakes in the center of the oven for 20-23 minutes or until a toothpick inserted in the center comes clean. Let the cupcakes cool slightly, then transfer them to a wire rack to cool completely. For icing, beat butter until smooth at medium speed with a handheld electronic mixer. Add powdered sugar, vanilla, and salt. Beat the mixture at low speed until combined. Add milk and beat until smooth (about two minutes). Finally, beat in as much strawberry jam to meet your taste bud's demands. To finish, top cupcakes with the icing, as well as some strawberry slices.